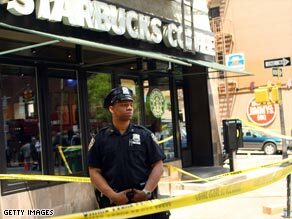 NEW YORK (CNN) -- A crude bomb made from a water bottle was used in an explosion that damaged a Starbucks coffee shop on New York's posh Upper East Side, New York police said. Monday's explosion shattered glass at the Manhattan Starbucks coffee shop. No one was injured. The Memorial Day explosion damaged the shop, but no one was injured and no motive has been identified for the bombing. "We believe it to be ... a six- to 10-ounce water bottle that was wrapped in black tape," New York Police Commissioner Ray Kelly told CNN on Wednesday. He said the bomb's powder may have come from fireworks components, including a fuse. The powder was placed inside the bottle in a way that made it "more powerful," Kelly said. He said a forensics unit is working on finding fingerprints. The homemade bomb, which went off around 3:30 a.m., shattered glass, but no one was injured. The store was not open. Police have said the device was planted under a wooden bench outside the coffee shop. "We have a witness who believes he saw two young people he describes as teenagers, both white males," the commissioner said. One is described as blond, wearing a red shirt, and the other had brown hair and wore a gray shirt. Kelly said the witness saw the two approach the Starbucks, then looked away. After the witness heard the blast, he said he saw the two young people run away from the building. Kelly said that for now, it's impossible to say whether the bombing was politically motivated. "We don't know if they were a corporate target or somebody had a problem [with] what was going on on that corner, in general ... we're not ruling anything out." In 1999, a Starbucks in Seattle, Washington, was vandalized during a world trade conference. In February 2008, a Vancouver Starbucks and another restaurant were damaged by an overnight explosion. New York police say they're aware of both incidents, but Kelly says it is too early to draw any conclusions. "In the past, they [Starbucks] sort have been identified with the globalization movement. ... We're not saying that this is the case in this matter."